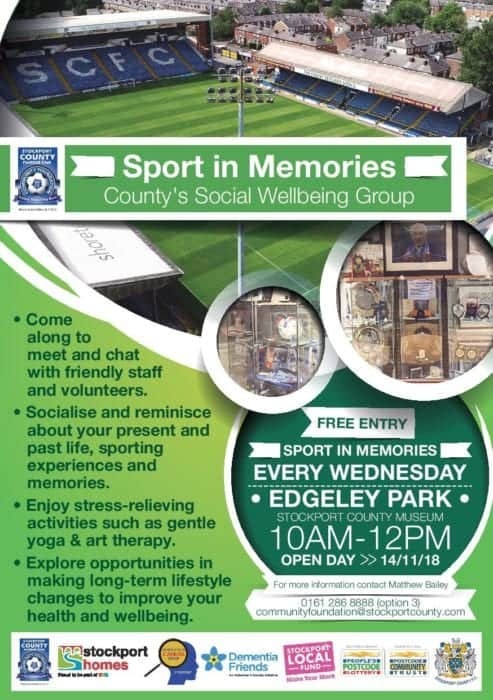 The Stockport County Community Foundation are delighted to announce the launch of another exciting new programme called “Sport in Memories” to be held at the Stockport County Museum at Edgeley Park. Sport in Memories is a new weekly Social Wellbeing Group open to the public providing opportunities for people to meet and make new friends, socialise and reminisce about their present and past life, sporting experiences and memories. In addition, they will be able to enjoy stress-relieving activities such as gentle yoga and art therapy from trained qualified professionals. The project being run by Stockport County Community Foundation, which is being supported by Stockport Council and the Postcode Community Trust, will be holding an Open Day on Wednesday 14 November between 10.00am and 12.00 noon at Stockport County’s Museum at the Edgeley Park ground. The Foundation are inviting people along, to enjoy light refreshments and to find out more!